Each issue features a long-form interview with a performance-maker and is produced as an extension of my own work with the aim of opening up discourse around live practices. Issue #1 features a conversation with artist, writer educator and curator of artist's moving image, Ian White. The interview took place in January 2012 and focuses on Ian’s live work — from early experimental collaborations to his landmark solo trilogy Ibiza Black Flags Democracy and hybrid curatorial projects. 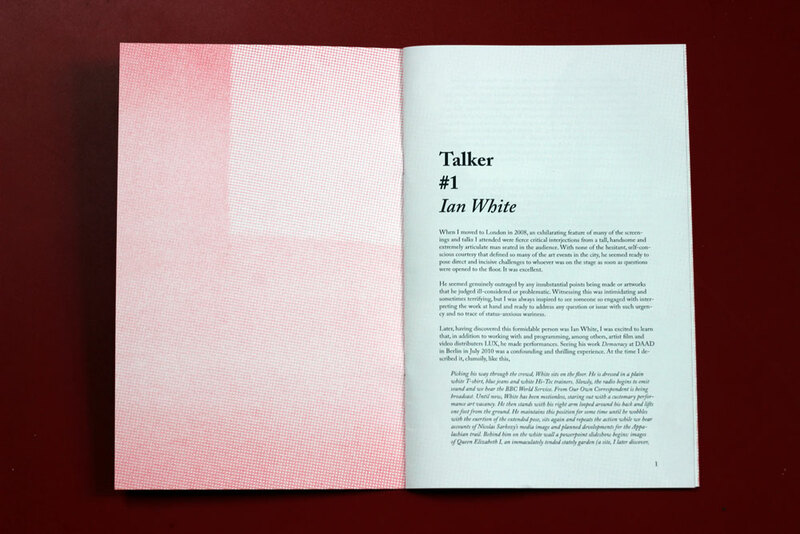 TALKER is 24 pages long, risograph printed in London by Hato Press. You can download issue #1 as a PDF here. Issue #2 with Kate Valk of the Wooster Group is out soon.